William S. Hart Junior and Senior High School — serving grades 7-12 — was the only one of either in the Santa Clarita Valley when this photograph was shot in the mid-1950s. Unused real photo postcard on Kodak paper, purchased in an online auction. On January 13, 1945, the California State Board of Education approved the petitions of five elementary school districts in the Santa Clarita Valley — Newhall, Saugus, Castaic, Mint Canyon and Sulphur Springs — to form the "Santa Clarita Union High School District." Two weeks later, on January 29th, local residents voted 1,184-7 to create Santa Clarita Union High School District. On March 9 they elected its first five-member board, and on June 2 they voted 432-2 to pass a $300,000 bond measure to build the valley's first high school on a 27-acre parcel in Newhall, 20 acres of which had been donated to the new school district. Local historian A.B. Perkins suggested the name "Santa Clarita," or "Little St. Clare," for the new school — a diminutive form of the name given to the valley and to its river by Father Juan Crespí in 1769. 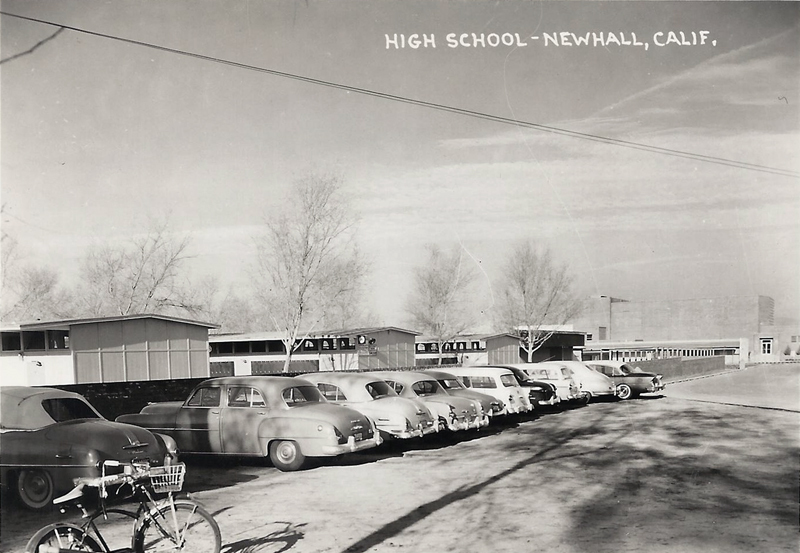 However, the school's opening in 1946 came just three months after the death of its chief benefactor, cowboy actor and Newhall resident William S. Hart. And so the school, and the school district, bear Hart's name to this day (although the school board occasionally flirts with the idea of changing the district's name back to "Santa Clarita"). The five original members of the Santa Clarita Union High School District governing board were elected on March 9, 1945. They were: Tom M. Frew, Jr. and S.S. Donaldson, representing the Newhall School District; Mary Bonelli, representing Saugus; Mildred Gilmour, representing Castaic; and Charles Brown, representing Mint Canyon and Sulphur Springs. All were current members of their respective elementary school boards with the exception of Frew, who had retired from the Newhall board after serving as its president for several years. LP5401: 19200 dpi jpeg from original RPPC purchased 2013 by Lauren Parker.